I see the straight & narrow when I walk a crooked road. Songs and artists/songwriters whose music shook me as a kid (with ears nearly as big as my heart). They guided the way to my own path as a singer-songwriter . . . These songs speak to the human condition . . . in all of our aching and beautiful glory . . . These songs are the truth . . .
Scott has a wonderful gravelly voice and is a masterful musician. I love his work. She’s been written in song by the best of names, Stephen Foster, Leonard Cohen, and Sweet Baby James. I got this feeling this won’t be the same. My love song for Suzanne. Nashville has a treasure trove of good songwriters. 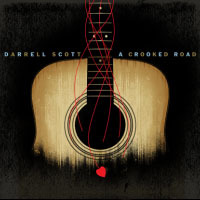 Darrell Scott is among the best. Enjoy the video of the title cut, and enjoy the album.